Drove down to Columbus and bought the HiTop this morning. It's in astonishing original condition and functions great. Jackpot counter reads 0053 -- machine appears to be well-maintained and never abused. The seller was friendly and is a devoted slots man -- he has a beautiful collection of outstanding machines. This HiTop is a great first slot and I'm pleased to own it. Thanks Jeff H. and others for your help and advice these past few days! you welcome, that's what we're here for. have a Jennings rock-ola revamp on it's way to me .
. . . not sure what a Jennings rock-ola revamp is -- is it a slot or a jukebox?! Saw this on eBay today. What is the story behind this, do you suppose? Rock-Ola over the years had their hands into everything but, juke boxes was their biggest product. 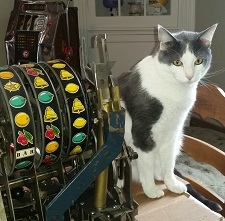 Well ,what I bought / got is a slot machine, 1920's originally made by Jennings , then bought & reworked by Rock-Ola to resell. mainly the lower casting is removed & their's ,with a jackpot was added. I'm trying to find out Who actually made the lower castings....... will be another thread over the weekend. the "Mills" slot you found is "over priced" big time. a totally reworked Mills slot machine done in England for English use. Surprisingly these seem to show up often in the U.S. Seems to be a wide Variety of different types / styles of these machines, in it self might be a good study.
. . . the Brooklands reminds me of when I was a kid living in Taipei, Taiwan. There was an amusement park and the arcade featured three old Mills Hitops that had perhaps been 'acquired' from the Officer's Club. These had been repainted and the reel symbols had been changed to images of some of the park attractions. They were played with the same tokens that were used for the rides. Indeed -- what happens to old slots after they 'die' would be a good study! 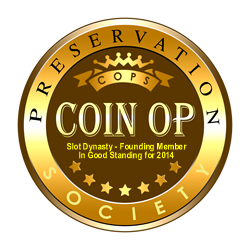 Old slots never die, they fall into the hands of restorers. Or at least I'd like to think so. leospanner wrote: Old slots never die, they fall into the hands of restorers. Or at least I'd like to think so. Well evidently this one wasn't so lucky! plating is in decent shape. Don't give up! . . .might need a new set of payout disks as well, if the butcher welded shut the payout holes for the cherries/oranges/plums/bells!